A Taxi in GTA III. The Taxi is a four-door sedan-based taxi featured, in some form or other, in nearly all of the games in the Grand Theft Auto series (with the exception of Grand Theft Auto: London 1969 and London, 1961, which instead featured the London Cab, and Grand Theft Auto: Chinatown Wars, where the Cabbie is the only taxi). Distinguishable by its yellow livery, it is often one of the most common vehicles on the road. Between GTA III and GTA Vice City Stories, the Taxi can be used to perform taxi side-missions. In Grand Theft Auto 1, there are three versions of the Taxi; the Liberty City version is based on the Portsmouth, the San Andreas version is based on the Vulture, and the Vice City version is based on the Flamer. The Taxi in Grand Theft Auto 2 is similar to an elongated Fiat 500 with the checkered stripe crossing the roof horizontally. Ray Larabie's early design of GTA 2's Taxi. GTA 2 (In-game, with lights). In GTA III, the Taxi resembles a cross between a late model Chevrolet Caprice and Ford Crown Victoria, although shrunken to the size of a compact sedan (the Caprice and Crown Victoria were full-size sedans). There are minor variants available, with darker bumpers and different taxi lights. In Grand Theft Auto: Vice City, the Taxi is a Ford LTD look-alike. In Grand Theft Auto: San Andreas the Taxi is based on the Premier, designed after the 1991-96 Chevrolet Caprice. The Taxi in GTA Advance has little indication of which car it is based on, but is generally more boxy in design when compared to the game's Police vehicle. The taxis in Grand Theft Auto: Liberty City Stories and Grand Theft Auto: Vice City Stories are largely identical to the GTA III and GTA Vice City renditions, respectively. The GTA Liberty City Stories rendition may appear with yellow, black, or gray bumpers, as well as two types of TAXI signs, a traditional one with the writing on the sides, and one with orange lights on the sides and the writing facing forwards. GTA III (Rear quarter view; different bumper color and taxi sign). Comparison of two differences available on Taxis in GTA III. Note that the Taxi on the right says "TAKI". GTA Liberty City Stories (Rear quarter view; different bumper color and taxi sign). There are two different taxi sedans in Grand Theft Auto IV; one built by Declasse, based on the Merit, which is the 2000-2005 Chevrolet Impala, and the other built by Vapid, based on the Stanier, influenced strongly by the 1992–1997 Ford Crown Victoria P72, with frontal design cues more similar to a 1998–2011 model. While the Taxis come standard with regular taxi lights, some have rooftop advertisements for "WTF", "Banging Trash Can Lids for an Hour", "Conjoined Twins", "The Science Of Crime", and Weazel News, both of which can detach in collisions. Both models contain a medallion on the front hood, which is used to indicate that New York City Taxi are licensed to pick up passengers; they also have a red marker on the back left. Vapid Taxis may also have yellow, grey, or black bumpers, much like the Taxis in GTA Liberty City Stories. Players can enter Taxis in GTA IV and take taxi rides to destinations, which is often a quicker alternative to driving themselves. Warning: in The Ballad of Gay Tony, using a taxi during missions will often result in the completion challenges for that mission being voided due to being able to bypass the time limit using one. A Vapid "Taxi Car" in GTA IV (Rear quarter view; with roof-mounted advertising and different bumper color). Declasse "Taxi Car" in GTA IV (Rear quarter view; without roof-mounted advertising). Early renditions of the Taxi are generally undesirable due to their mediocre performance. While differing between cities and partially based on muscle vehicles, GTA 1's taxis are generally slow, but compensate with good steering. In GTA 2 the opposite is the case, with moderate speed but sluggish controls, inferior to the Taxi Xpress. Both games' renditions have moderate crash endurance. Each Taxi in GTA 1 has a low base export value of $2,000, while the Taxi in GTA 2 awards the player Double Damage when crushed. Although the appearance of the Taxi between GTA III and GTA Vice City Stories varies drastically, the Taxi's performance in these games may be described as all-round average. With moderate speed, moderate acceleration, light construction, moderate endurance, capable steering, and stable cornering (all traits which are helpful during Taxi Driver missions), the Taxi is generally an acceptable vehicle to drive. The vehicle is also front wheel drive, reducing the chances of tailspins when cornering and allowing the vehicle to perform 180-degree turns backwards or forward with ease. The GTA III rendition of the Taxi possesses almost identical handling properties to that of the Kuruma. However, the Taxi does not suffer from the stiff suspension and heavy kerb weight the Kuruma has. The GTA San Andreas rendition of the Taxi has a 0-60 mph (97 km/h) acceleration time of only 5.4 seconds and a top speed of only 89 mph (144 km/h). Two taxi models are present in GTA IV. The Declasse Merit-based taxi in GTA IV is powered by a V6, coupled to a 5 speed gearbox in a RWD layout. Acceleration is very good, and the top speed is above average: 87 mph (140 km/h). The brakes have been upgraded over the regular Merit, requiring a shorter stopping distance and thus reducing the risk of being ejected through the windshield after a frontal impact. The suspension has also had an upgrade, making this vehicle corner more effectively at speed. Crash deformation is acceptable, and the car can survive a few frontal impacts before giving. The Vapid Stanier-based Taxi is powered by a 4.6 L V8, coupled to a 5 speed gearbox in a RWD layout. Acceleration is good, and the top speed is above average: 87 mph (140 km/h). Its braking and suspension are very good, identical to that of the Police Cruiser; ABS is standard, and the suspension easily handles cornering and smooths out the bumpy roads of Liberty City. Crash deformation is good, and the vehicle can sustain multiple frontal impacts before failing. Strange enough, both cars are slightly slower than the GTA San Andreas rendition, which can reach 89 mph (144 km/h). The Taxi in GTA V is based on the second generation Stanier. Its gearbox, engine specs, and layout are exactly the same as the first-generation Stanier. Overall performance is identical to the Police Stanier, although its engine is markedly less powerful. In GTA San Andreas, the Taxi is one of only a handful of public vehicles that could be customized at a modification workshop, specially, at TransFender. The modification options of the vehicle are modest, and are nearly identical to the modification options available for the Premier, which the Taxi is based on (the only option unavailable is the roof scoop option, which presumably clashes with the Taxi's rooftop taxi sign). In GTA Vice City, Taxis have white spots on the windshield due to an error in applying the vehicle's reflection map. In GTA III and GTA Vice City, Taxis may very rarely spawn without their lights on top. In these cases, saving the car in a garage will not fix it. In GTA IV, the taxi light can be broken off by impacts. In GTA III, the player will get $25 after carjacking a taxi. Taxi drivers tend to be vengeful, exiting their vehicle and assaulting the player if they damage the taxi; they may pull the player out of their own vehicles, or throw punches if they meet the player on foot. In GTA IV, they hold onto the player's car door while he or she attempts to escape, until the gaining speed forces them to let go. Oddly, sometimes they will pull the player out of their car, and then utter something before running back to their taxi and drive off. The GTA IV Taxi originally had a black variant, as seen in the Vladimir Glebov trailer. 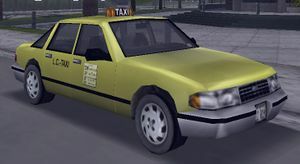 In GTA Vice City, the beta texture of the taxi appears when it is seen from afar. In GTA IV, most taxi drivers are men, however, you can usually find a woman taxi driver in Hove Beach, Broker. In GTA IV, the Vapid, Declasse, and Schyster Taxis have three different horns, differing in pitch with some with a high pitched, medium pitched, and lower pitched horns. The pitch determines how well and strong the horn sounds. The higher ranges usually are weak, mid-ranges usually have a somewhat over-blown or out of tune horn, while the lower pitches have healthy and loud horns. Most of the horns used can be traced back to civilian vehicles of different brands (such as Intruder, Pinnacle, DF8-90, Patriot, etc). A glitch sometimes happens when either taxi is stored in a parking spot and after a period of time, the horns will change no matter if it has been used or not, such as loud and healthy horns will change to the high pitched weak horns for no apparent reason. Loading any game saves changes them as well. In GTA IV, if a Taxi is rammed at a high enough speed, the taxi driver will die more easily than if any other car is rammed. Most of the taxi drivers in GTA IV speak in the Greek language, as well as most of the. A taxi driver may say "I'm Greek, you know" when held at gunpoint. Also, they usually cuss out traffic in front of them in Greek as well. In the first trailer to Grand Theft Auto IV a early version of the Vapid taxi can be seen on the Algonquin Bridge. In GTA IV, if the taxi sign is broken off of a taxi, it will still react as if it were attached. If the player turns off the engine, the light for the advertisements will turn off, and will turn back on when the player gets back in the taxi. Also, when the player destroys the cab, it will appear burnt no matter how far away it is from the car. In GTA IV, if a taxi is stored in a parking spot with the "on hire/duty" lights illuminated on the signs, they will sometimes spawn turned off or on randomly. However advertisement signs don't react with it. Parked on the opposite side of the road to Salvatore's Gentlemen's Club, Saint Marks, Portland. Commonly parked in Newport Multistory Car Park, Newport, Staunton Island. Parked in the parking lot of Francis International Airport, Shoreside Vale. Two parked in front of the terminal of Francis International Airport, Shoreside Vale. Parked outside Mean Street Taxis, Trenton, Portland. Parked in front of the stairs leading to the Shoreside Terminal LCS, Francis International Airport, Shoreside Vale. A Vapid Taxi can be found parked in an alley near Manganese Street and Burlesque in Star Junction, Algonquin. Taxis are the the most commonly spawning vehicles in Liberty City, and are particularly common in Downtown, Broker, Francis International Airport, and throughout Algonquin, especially The Triangle and Star Junction where Taxis make up the majority of road traffic. Taxis are less common in peripheral, industrial, and suburban areas of the city; notably, taxis will rarely spawn in eastern Dukes and northern Alderney and never spawn in Acter Industrial Park (Alderney), and in parts of Bohan. London Cab, the British equivalent featured in Grand Theft Auto: London 1969 and London, 1961. Taxi Xpress, another taxi featured in Grand Theft Auto 2. Cabbie, the older, Checker cab-style equivalent seen in the GTA III era. Borgnine and Zebra Cab, variants of the Cabbie. Cabby, a minivan taxi featured in Grand Theft Auto IV. This page was last modified on 12 August 2016, at 08:53.